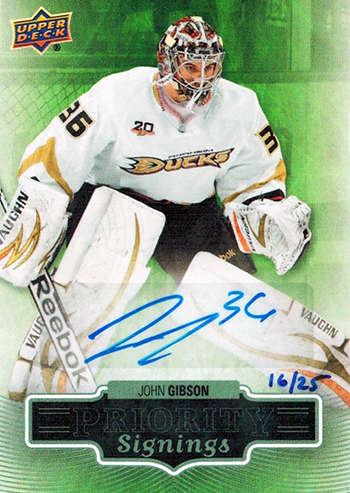 Don’t Miss the Boat on John Gibson, the Future of the Anaheim Ducks! The future is now for the Anaheim Ducks. It may have arrived a little earlier than some expected – and in the middle of second round of the Stanley Cup Playoffs, ordinarily the timing might be considered a little peculiar. But John Gibson is not your ordinary goaltending prospect. 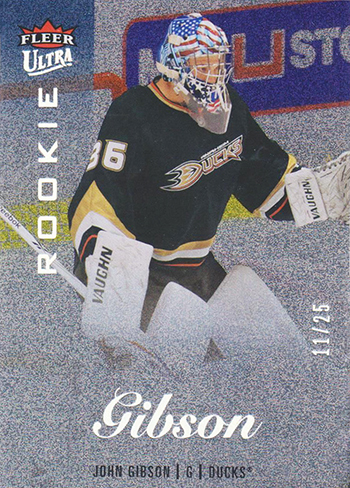 For collectors, particularly those who favor collecting goaltenders, Gibson rookie cards are just starting to hit the market. And as he suddenly finds himself the starter for a team one win away from breaking through to the Western Conference Finals, he is the clear-cut top goaltending prospect in the game, and one of the most intriguing prospects to collect overall. 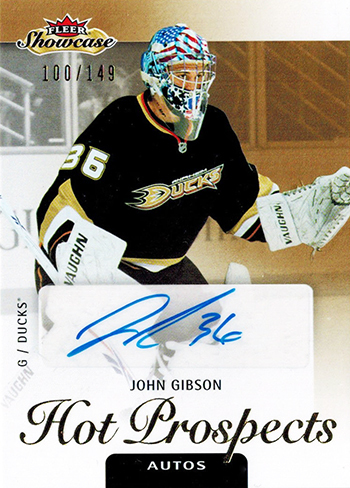 Gibson made his NHL® debut in the final week of the regular season while long-time starter Jonas Hiller (an unrestricted free agent this summer) was struggling, and rookie Frederik Andersen was recovering from an injury. After shutting out Vancouver in his first game and winning his next two as well, and looking very solid in doing so, there was even talk of Gibson being named the Pacific Division champions’ starter as the playoffs got underway. 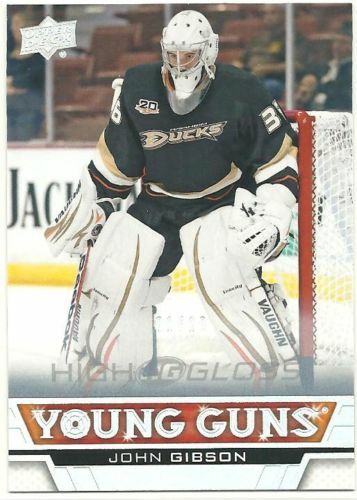 It appears the Jonas Hiller era with the Anaheim Ducks may be coming to an end with the impressive play of John Gibson. That turned out to be premature, but not by much. Fast forward less than a month and the former second-round pick in 2011 was thrust into action to start Game 4 of the division finals with his team staring at a 3-1 deficit if it lost, playing its biggest rival on the road. Ho hum, no big deal, all the kid did was post a 28-save shutout to earn First Star of the game and even the series. It was almost laughable the next day when Ducks coach Bruce Boudreau announced Gibson as the team’s Game 5 starter, as if he might actually have been seriously considering someone else. Gibson might have been even better Monday, despite giving up three goals, as Los Angeles peppered him with 42 shots but still lost 4-3. He played admirably in Game 6 as well and it was the first time he lost after posting five wins. For U.S. hockey fans, this Freeway Series is providing a great glimpse of the present and future of country’s fortunes in goal. 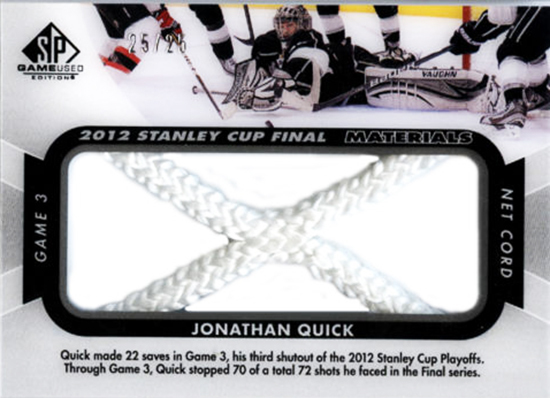 The Kings starter, former Conn Smythe Trophy winner Jonathan Quick, was the go-to netminder for the Americans at the Olympics in Sochi and is among the top five in the world at the position. Gibson may soon be in that conversation. The Freeway Series is additionally compelling as it pits two of the top American goaltenders against each other. When American-born players gathered last July in Colorado Springs for an orientation camp to begin sorting out the Olympic roster, six goalies were invited to participate – five of them established NHL® standouts. The other had barely celebrated his 20th birthday only a week earlier and had only 40 minutes of professional experience in the AHL on his resumé. Certainly nobody expected Gibson would actually make the team when it headed for Sochi, but the fact he was invited at all spoke volumes. Gibson’s exploits for Team USA are already well documented but for a quick recap, he’s already earned a pair of gold medals in his junior career and was named Best Goaltender at both those tournaments. He helped the Americans win gold for a third straight year at the Under-18 World Championships in 2011; then was all-everything for the Red, White and Blue at the Under-20 World Juniors in Ufa, Russia, in 2013, leading all goaltenders in both goals-against average and save percentage and taking home tournament MVP honors. And to top things off last spring, the 19-year old was named to the U.S. roster for the men’s World Championships, splitting starts in the round robin with the Tampa Bay Lightning’s Ben Bishop. But when the medal round started, it was Gibson, not the established veteran Bishop (who went on to be named a Vezina Trophy finalist at the end of 2013-14) manning the net for a quarterfinal against a Russian team boasting Alex Ovechkin, Ilya Kovalchuk and Alexander Radulov. Gibson won that game then started the semifinal against Switzerland two days later, then was brilliant in stopping 36 of 38 shots against Finland as the U.S. earned a bronze medal less than 24 hours later. Time and again this youngster has been given a chance to play in a big spot, and time and again he has risen to the occasion. The notion that a team that won its division and finished with the best record in its conference would turn to a 20-year old with three games of NHL® experience instead of a healthy, seasoned and high-quality veteran of Hiller’s caliber is mind-boggling. Even Patrick Roy, who guided the Canadiens to the Stanley Cup and won the Conn Smythe as a rookie in 1985-86, had 47 games in the regular season that year to get his feet wet. And yet, while the sample size is still very small and Gibson and the Ducks have a long way to go before reaching those lofty goals, the results so far have been beyond what most anyone could have anticipated. Could John Gibson be the next Patrick Roy? It’s too early to tell, but the future looks bright! He could be the surprise star of Upper Deck’s 2013-14 NHL® Double Rookie Class, but with each win he posts, demand for those rookie cards will rise. 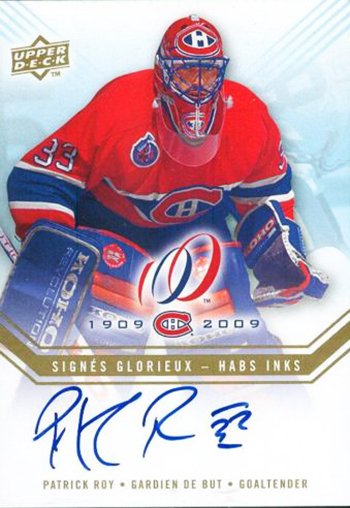 And some of his best cards are still to come in sets like 2013-14 NHL® SP Authentic and 2013-14 NHL® Ultimate Collection. Get them while you can!